Posted on 15th March 2017 at 8:10 pm. This tip connects the idea of aging well and dance career longevity to current studio practices. The idea that, what we do now in the dance studio directly affects how our bodies age and perform later, is one that I often talk about within the bounds of my own research on aging and range of motion (ROM). Perhaps one of the most controversial subjects for dancers and those who train them is the subject of stretching. Which types of stretching to do and when, during an active day, is a conversation happening across the sports industry offering multiple perspectives that often conflict. For dancers, most of us have developed as artist-athletes without adequate information on this subject. Many can recall entering the dance studio, dropping the huge bags and plopping down on the floor into the widest second position the legs could make and forcing chests down. This practice and others like it still occur in studios everywhere. However, there is a growing hunger, thankfully, for more adequate and up-to-date information being driven by new and old generations of dancers alike who are also scholars and athletes. While increasing ROM is sometimes considered a task for younger dancers, the idea of increasing or simply maintaining ROM as a dancer ages is sometimes abandoned because the pain of stretching is too great. Further, dancers who have sustained serious injuries due to overworking and overstretching during their active careers will find it difficult to participate in a stretching program, especially if those stretching activities only include the traditional ‘hold and stretch’ movements, more aptly known as static stretching. Complicating things further is the fact that many dancers are have ‘hypermobility syndrome’, which can increase the need for strength training in addition to a stretch program to ensure adequate musculoskeletal balance. The order is tall but dancers, who are by nature high achievers, are up to the task! All of this begs the questions: What types of stretching are there and which ones are the most effective for increasing and maintaining ROM? And, more importantly, why is stretching a cold muscle bad? These are great questions, the answer for which every dancer old and young would benefit from knowing. Some of these terms are commonly confused and misused. Dynamic stretching means a stretch is performed by moving through a challenging but comfortable range of motion repeatedly, usually 10 to 12 times. (for dancers, leg swings, fall and recovery activities, etc.) Although dynamic stretching requires more thoughtful coordination than static stretching (because of the movement involved), it is gaining favor among athletes, coaches, trainers, and physical therapists because of its apparent benefits in improving functional range of motion and mobility in sports and activities for daily living. 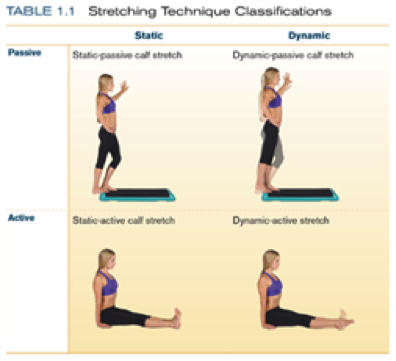 Every stretch is static or dynamic and passive or active, as illustrated in the examples shown in table 1.1 above. However, most experts now agree that although static-passive stretches have many benefits, it’s best to do more dynamic-active stretches. Because dynamic-active stretches require you to use and build your own strength while moving through the stretch, they are more helpful for improving functional movements used in everyday life and in sports. In addition, because dynamic-active stretches are movement oriented, these stretches can help generate heat, which can make the muscles more pliable. Finally, evidence suggests that because dynamic-active stretches require muscle activation and contraction, the muscles being stretched are triggered to relax even more than they might during a static-passive stretch, thereby reducing the risk of injury while increasing the functional benefit. Other things to consider: Dancers who are naturally flexible should be monitored closely during stretching activities for form and hypermobility tendencies. Dancers desiring to simply maintain ROM could also benefit from bone-building resistance training alongside ROM flexibility training. Dancers in the midst of an active performance career need to time their flexibility programs wisely during their dance day with consideration for room temperature, strength preservation and injury prevention. Until next time, friends, dance healthy, long, strong, and warm up before stretching! 1. Blahnik, J., Full Body Flexibility, Second Edition, Human Kinetics, 2011. 2. Solomon, R., Solomon, J.,Minton, S.C., Preventing Dance Injuries, Second Edition, Human Kinetics, 2005.